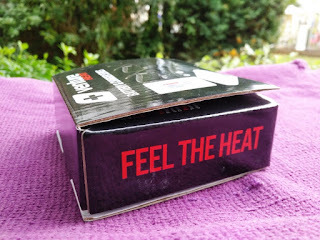 Hands are pretty sensitive extremities so it makes sense to take care of them when the weather calls for it. 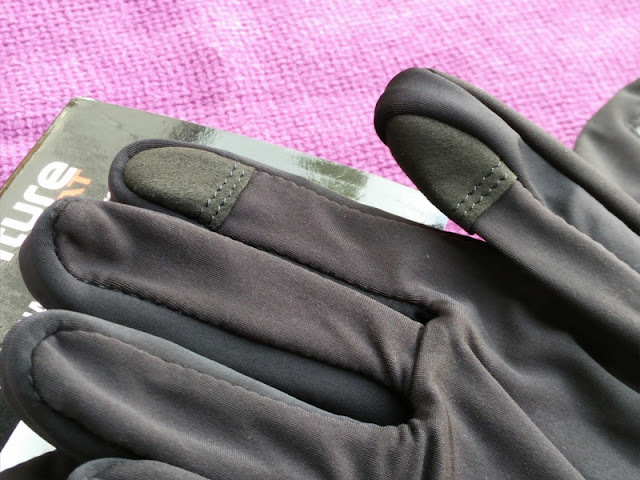 When temperatures dip below freezing, hands tend to particularly feel the pinch especially if you are abnormally sensitive to cold or suffer from Raynaud's, which is an extremely painful condition that you wouldn't wish on your worst enemy! 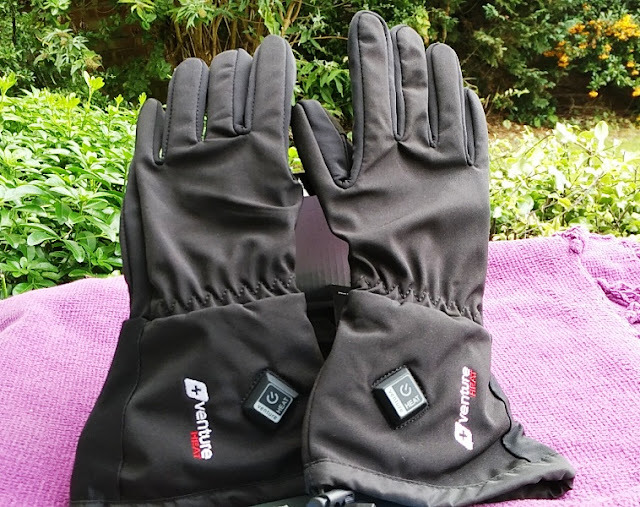 Numb hands is no joke especially when operating a bike or motorcycle on the way to work, which is why a pair of heated gloves like the Venture Heat battery operated glove liners makes all the sense in the world especially if you suffer from Raynaud's syndrome which nothing short of heat can bring Raynaud's hands back to life! 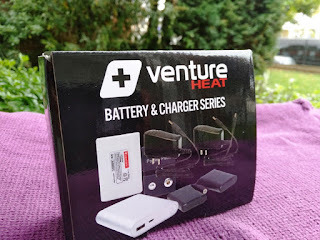 Venture Heat gloves have a nice clean design with small batteries that you can easily install in seconds. 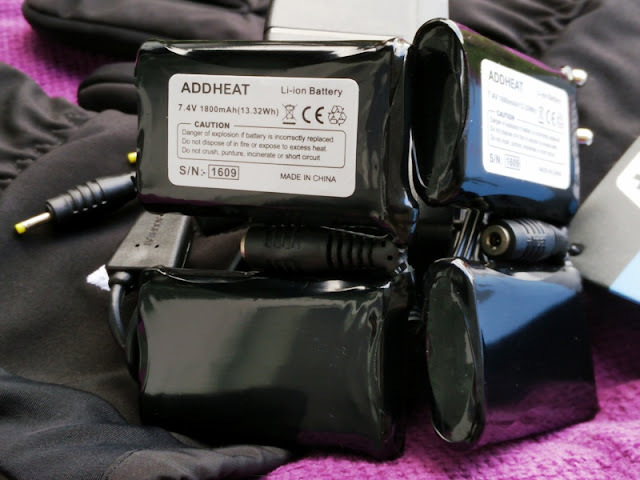 What's neat about these battery operated glove liners is that they are self contained thanks to a regulator built-in the controller which shuts off the gloves automatically when battery voltage becomes low. 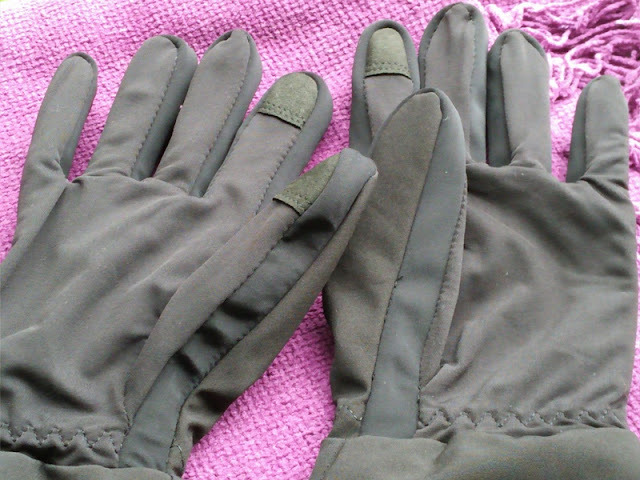 These glove liners by Venture Heat have a polyester and spandex Lycra construction so they provide a good, snug fit that is perfect for wearing under your current gloves to keep your hands nice and toasty in cold days. 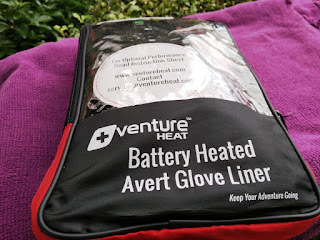 The battery heated gloves by Venture Heat are actually very comfortable on the hands and they're not bulky at all considering the addition of a heating element and a battery. 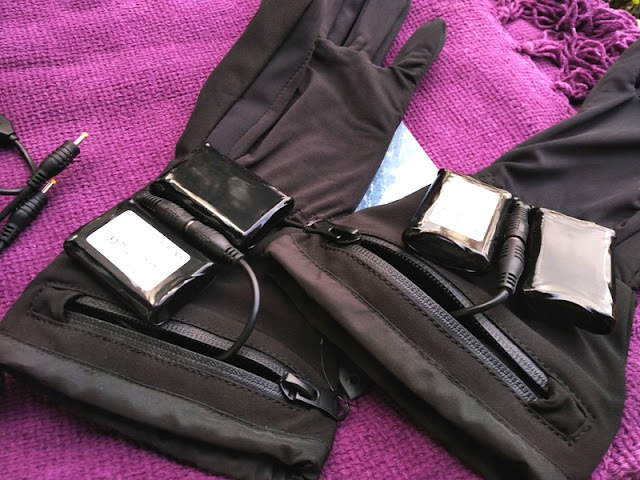 The batteries themselves fit inside pockets on the top of the glove, just above the wrists so the batteries don't obstruct the range of motion of the wrist and hand. 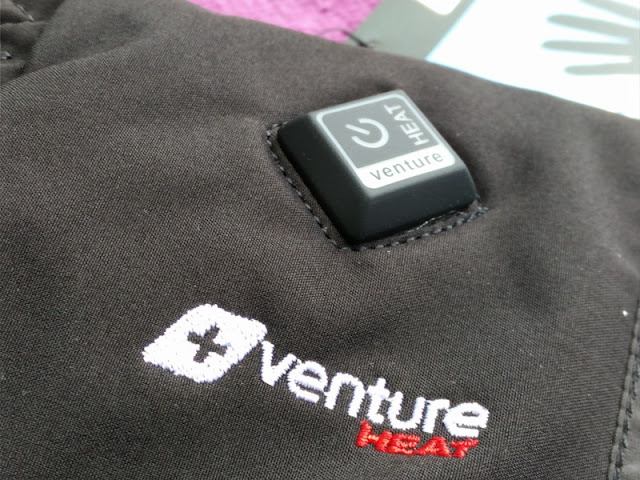 It takes literary seconds for Venture Heat's glove liners to heat up so heat transfer through the heating element happens pretty instantly. 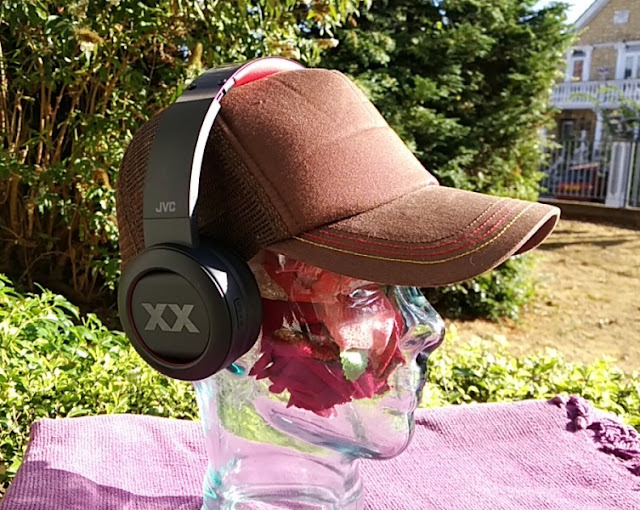 You get three heat settings for controlling the intensity of the heat which include red (high), amber (medium) and green (low). 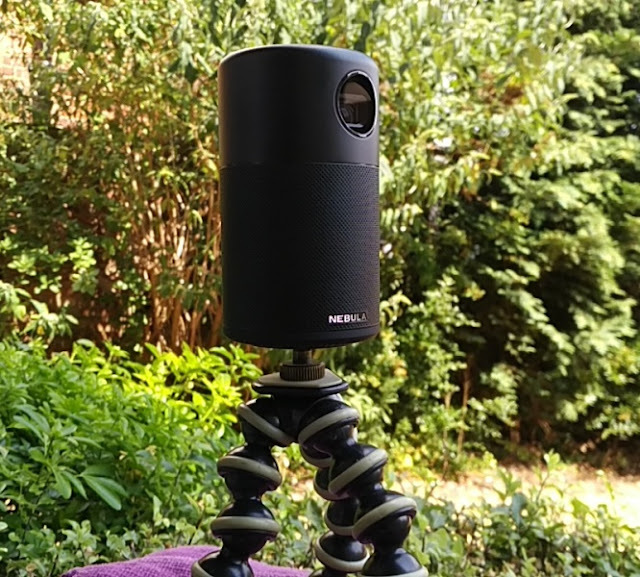 The highest heat setting reaches around 57 C degrees in temperature. 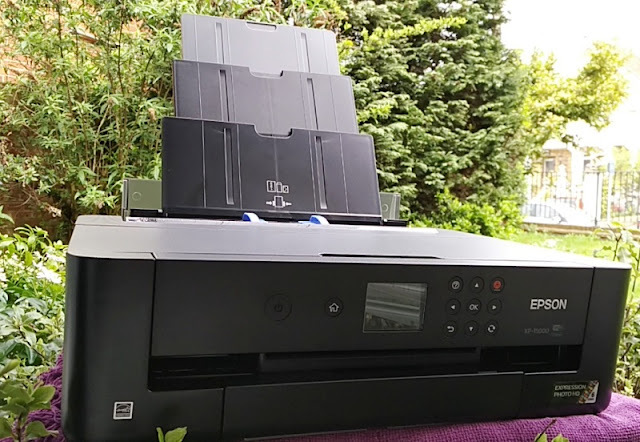 Toggling between heat settings is done by pressing the button, which also doubles as the power button. 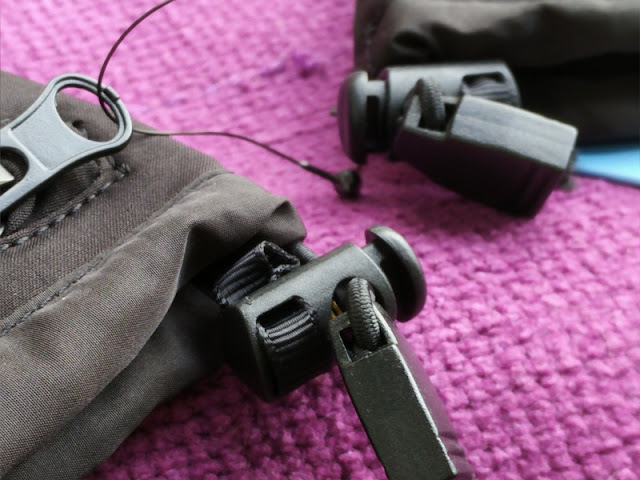 Powering on the gloves is done by holding down the button, which also turns the high heat setting (red) by default. Press the button once more for medium heat setting (amber) and press again for the lowest heat setting (green). 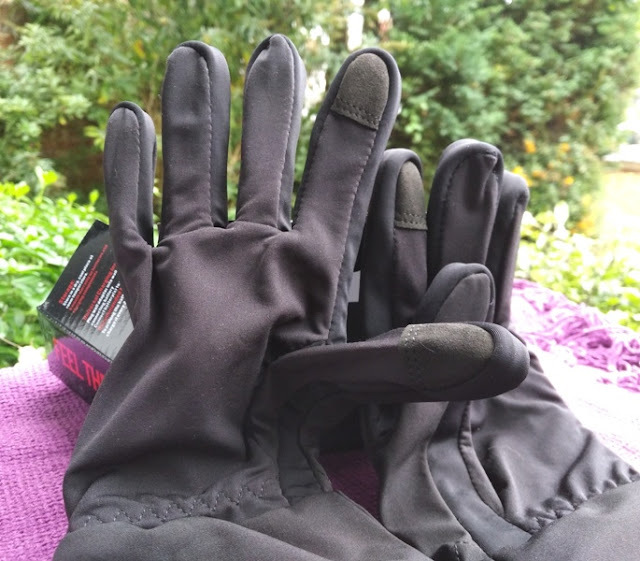 The heating element, which is very thin and hardly noticeable, is integrated in the gloves and runs along the outer edge of each finger down to the wrist and thumb finger. 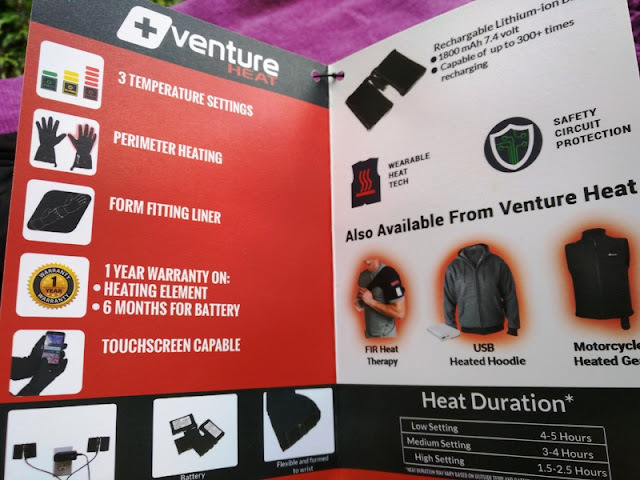 The exterior of the Venture Heat battery heated winter gloves is made of 86% polyester and 14% spandex, making the exterior of the gloves stretchy and tough but soft to the touch. 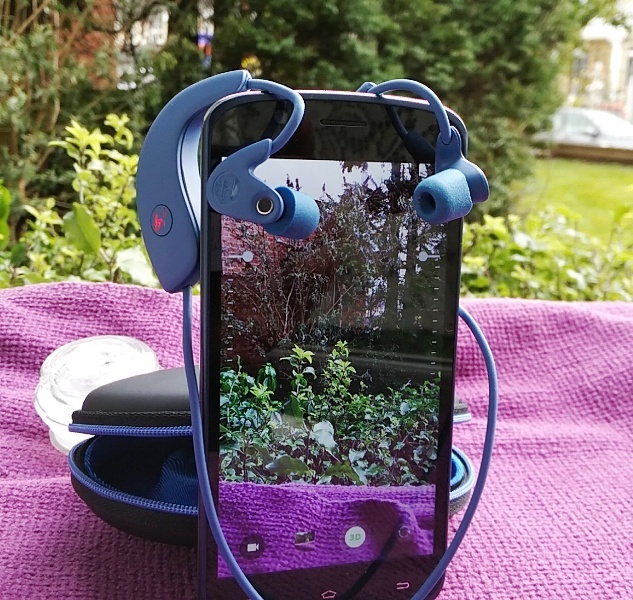 The tips of the index and thumb fingers are reinforced with leather-like material for operating a phone with the gloves on, making them touchscreen capable. 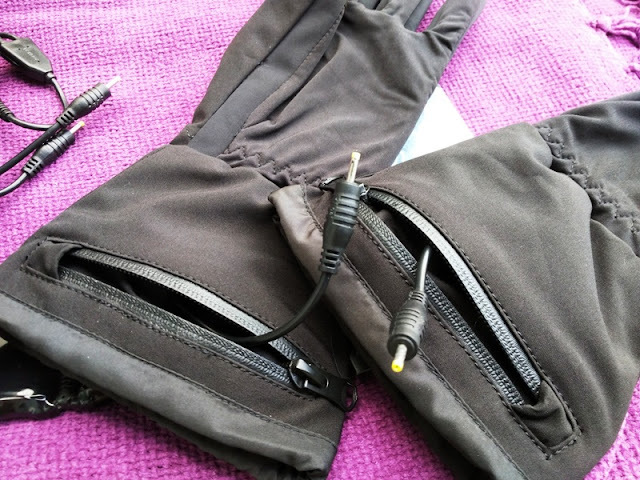 Venture Heat's heated glove liners have dedicated waterproof zippered pockets for inserting and removing the batteries. 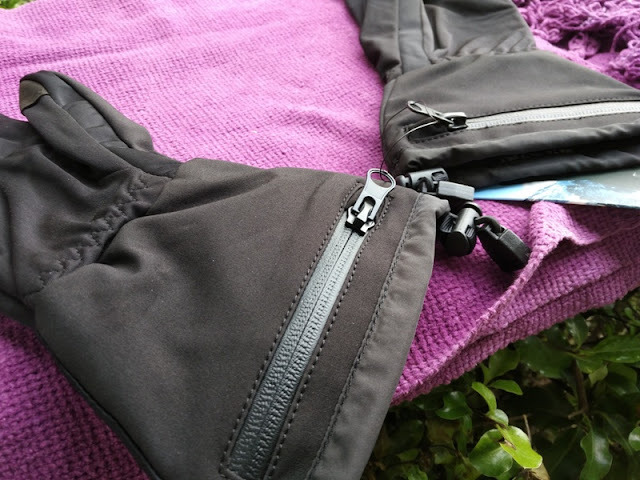 The battery pockets are located at the end of the cuffs, which are extra long and feature drawstrings to seal in the heat in the wrist area. 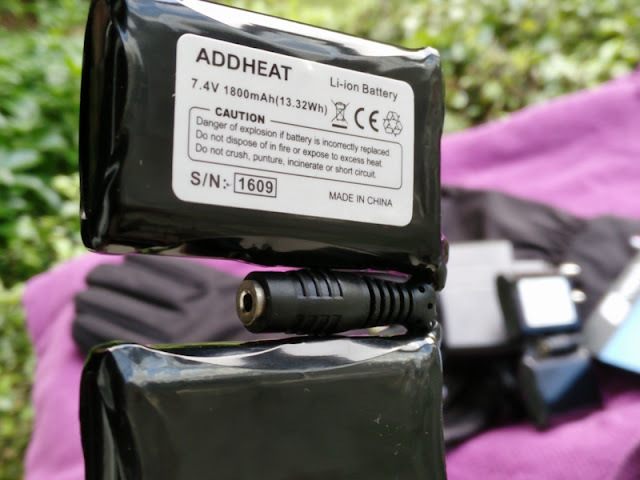 The total weight of the heated gloves, including the batteries is 310 grams (136 grams without the batteries). 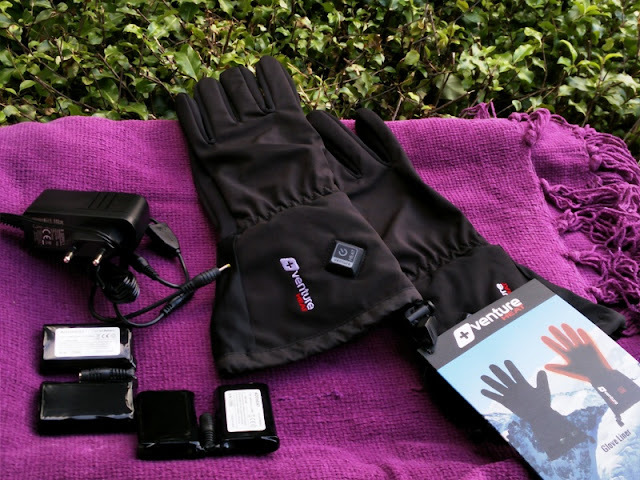 The heated gloves are powered by a pair of BX-25 batteries which are made of rechargeable lithium ion with a total power capacity of 3,600mAh (1,800mAh each) at 7.4 volts. 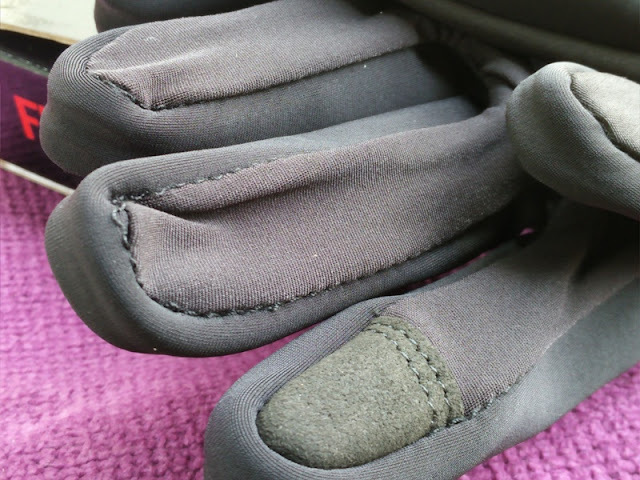 If you ride a bike, it's worth looking at the motorcycle version of Venture Heat's glove liners for convenience. 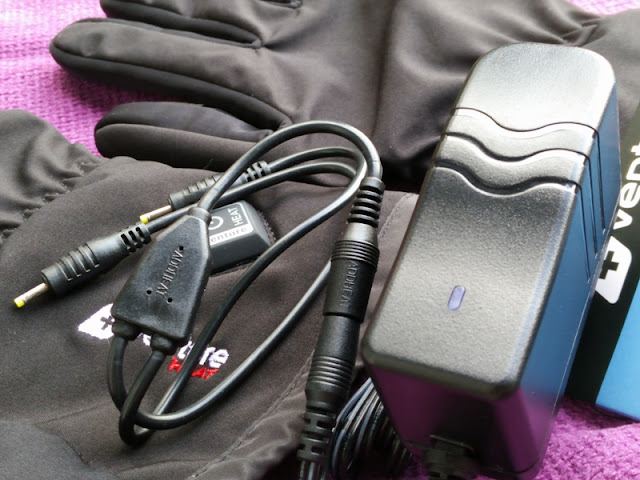 The power charger for the heated gloves is a BX-25 power charger so it features dual plugs for charging both gloves at the same time. 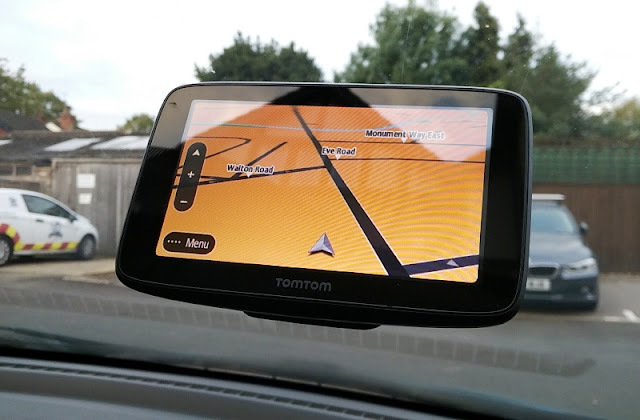 Full charge takes between 45 minutes to an hour and battery life can last up to 5 hours on the lowest setting (green light). 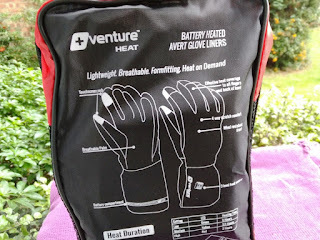 On high and medium setting, the battery life of Venture Heat's glove liners is 3.5 hours and 2.5 hours respectively. 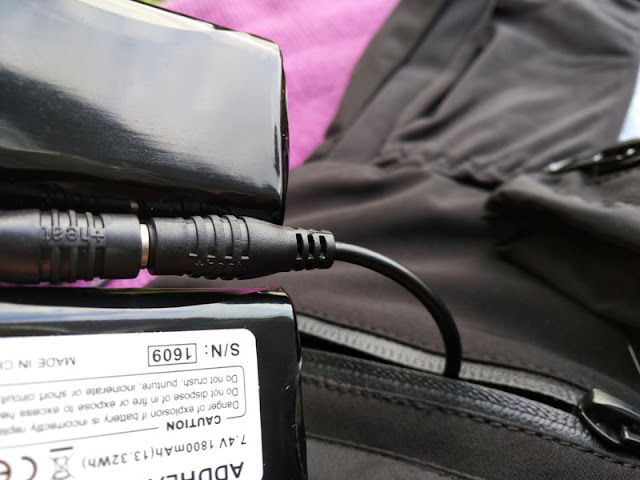 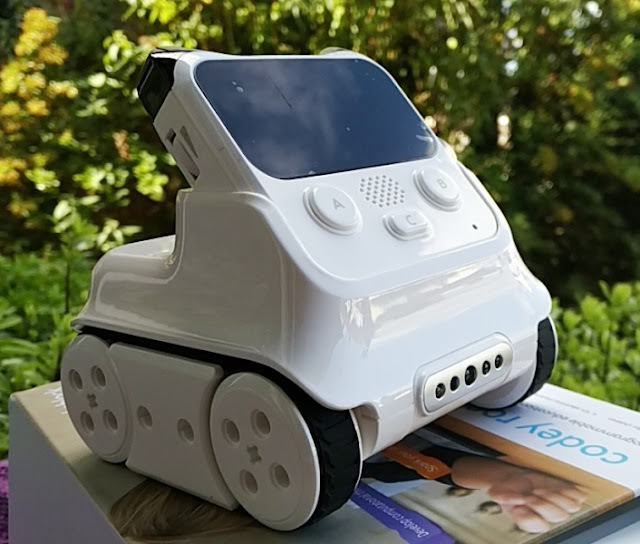 When the batteries are fully charged, the LED on the power charger goes from solid red (charging) to solid green (full charge). 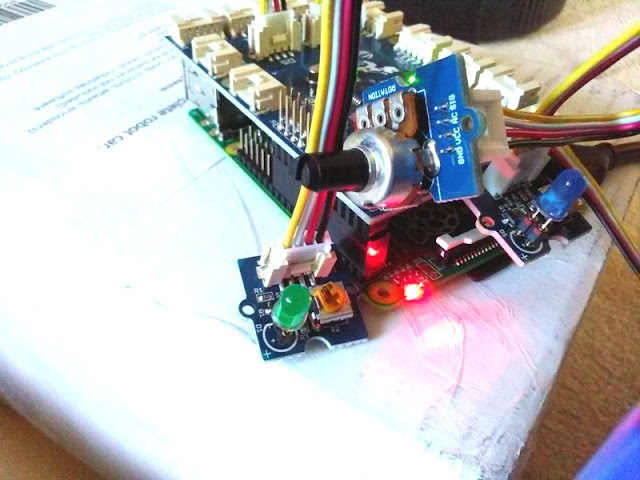 Twenty minutes before the batteries are fully charged the LED on the power charger flashes green and red. 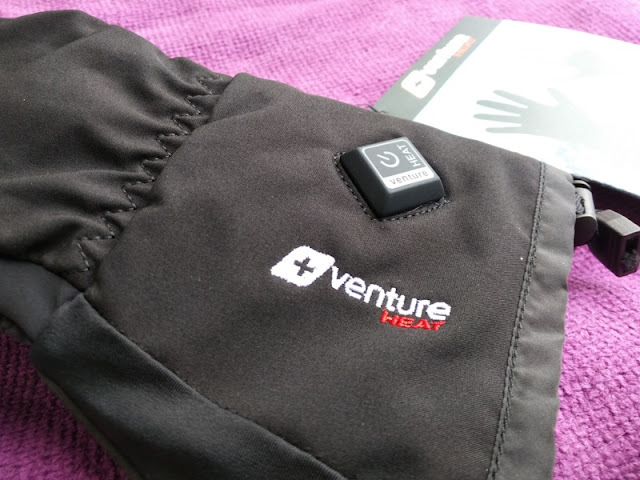 Venture Heat heated gloves are washable with a damp cloth or by hand in cold water with mild detergent.